For several weeks, bitcoin has remained in a consolidating uptrend. The market hasn’t seen a new high since mid-September, but the lows have steadily gained higher and higher ground. Overall, the volume is highly consolidated and the market is ready for a large move — the question is, where will it move next? A test of this downtrend will yield important information about what investors can expect in the coming weeks and months. A decisive break of the downtrend will be a very strong buy signal to a lot of large players that have capital sidelined. If the market manages to break and hold support above the downtrend, that will be a sign to many investors that, at minimum, a break of the downtrend is likely and a new trend is likely to develop. Whether that new trend yields a sustained uptrend, sideways consolidation or a temporary reprieve from months and months of a bear market remains to be seen. However, it will, at minimum, be a point of high volatility and likely be the sign of hope the battered bulls are looking for. However, if this test is rejected, bitcoin will undoubtedly see a test of the high $5,000s to the low $6,000s range. A rejection of this downtrend would be the result of poor market demand as this would be the fifth rejection so far, and I would highly expect to see a test of new lows. Whether or not the market rejects or blows right through the downtrend line remains to be seen. Either way, I would personally consider this a no-trade zone. The market is very tightly consolidated and squeezed between support and resistance, and I would highly expect the next move to be very strong. The next move will likely shape the state of the market for weeks and months to come. 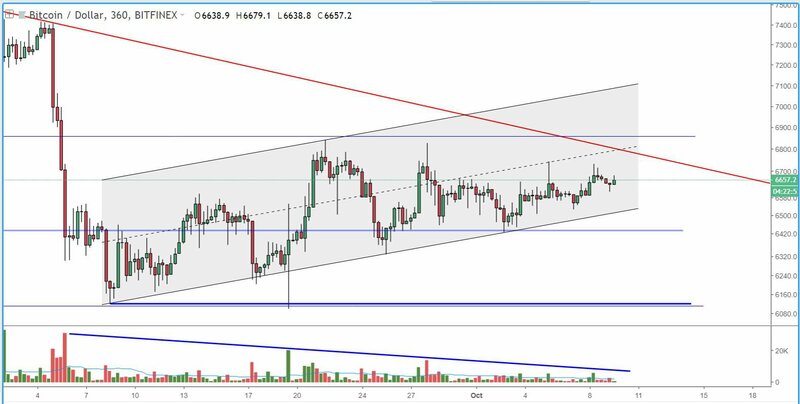 This supply-and-demand channel has shown a relatively bullish trend as the market has made consistently higher lows with consolidating volume. The downtrend (outlined in red) shows just how close the market is to its next test and, given the supply-and-demand channel, it seems unlikely that any major movement will occur without a proper test of the downtrend. Similarly, the next major movement will likely be in the form of a channel breakout either to the upside or the downside. The first signs of strength or weakness in the market will be either a failure to maintain the uptrend/support of the demand side, or a complete breakout to the upside of the channel. For now, we will have to wait and see if demand surfaces on the next test of the multi-month downtrend. For several weeks, bitcoin has consolidated in an upward sloping supply and demand channel. Overall, the market is very tightly consolidated and will likely yield a very large, sustained move. It is unclear whether or not the move will be to the downside or the upside. We are slowly snaking our way toward a multi-month downtrend and will have the market making its fifth test of the resistance. 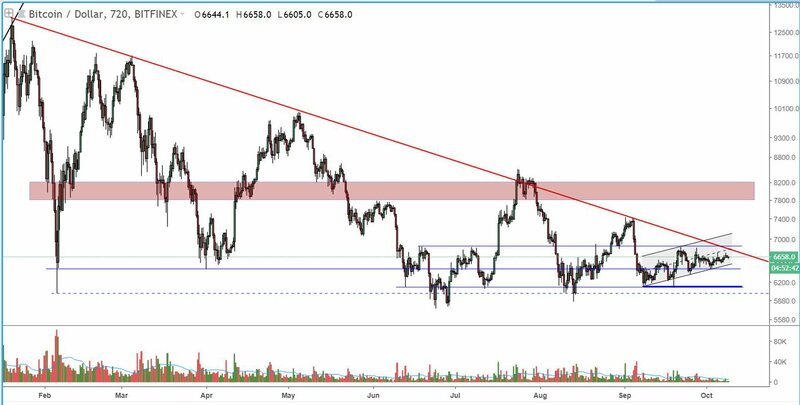 If we manage to break the downtrend line, we will likely see a strong swell of demand hit the market as it will be a sign to large investors that the market is exhibiting signs of bearish exhaustion. However, if we reject the downtrend line, I fully expect to see a test of the upper $5,000 range before any meaningful demand surfaces.